Insurance costs & Stickers - Whats the link? Burglaries may be decreasing but a worrying new crime, where homes are marked, proves organised gangs are trying harder. Master criminals have replaced Burglar Bill, introducing a sinister new element to house breaking, and pushing up the cost of home cover, insurance giants have warned. 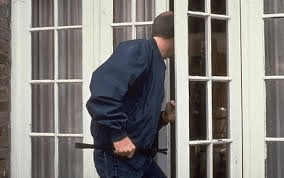 Improved household security has beaten old-fashioned opportunist burglars, claims experts say. These have been replaced by sophisticated criminals, who are organised. They carry out detailed surveillance, target individual homes or groups of homes, and exploit technology to maximise the haul and minimise the risks. “sticker scam”. After carrying out surveillance, transparent stickers, advertising, say, a bogus locksmith, are left on letterboxes to mark up the best prospects. The gang returns the next day and makes a clean sweep of those households targeted. The soaring price of gold is partly being blamed. A decade ago gold sold for less than £250 an ounce, but today trades for £761. The gangs go in specifically looking for gold and jewellery and use a metal detector to locate the items. They carry cash for gold envelopes in their pockets and have runners to take the letters straight to a post box. “They know what they are looking for and the metal detector lets them locate it in record time,”. “Posting it off straight away means if they get stopped in the street they have nothing to incriminate them. Similarly, if the police raid their homes, they will not find anything,” said Hull, who also works for Direct Line’s Privilege subsidiary, which specialises in homes with higher levels of wealth. Adrian Webb, a spokesman for Esure, added: “Gangs are targeting higher value homes. It is much more sinister with criminals doing their homework and effectively treating a spate of break-ins as a major project, planning everything in advance. The actual number of burglaries has been falling, as households have increased security by installing good window and door locks, burglar alarms and setting up neighborhood watch schemes. Nevertheless, burglaries remain the single largest cause of home insurance claims, said AA Insurance Services, one of the nation’s biggest brokers. Burglary claims reached 165,000 in the first nine months of last year, according to the Association of British Insurers and are expected to top 220,000 for the whole of 2013, when stats for the final quarter are collated later this month. The average cost of claims is rising. At Esure, compensation payouts for the average burglary rose by 29pc over the past three years, with its biggest claims topping £100,000. The average burglary claim at the AA is £1,752, with its highest value claim reaching £67,562. All homes are assessed for risk when setting premiums. Unfortunately, if your road or postcode suffers a spate of burglaries, then its risk profile may change and it could end up costing you more. Esure said in a worst-case scenario, premiums could more than double if your road is hit by a synchronised crime attack. In this scenario, the annual premium for a four-bedroom, semi-detached home in a road normally rated as low risk, might climb from £135 to £298 after it is re-rated as high risk. Insurers warn homebuyers to increase vigilance of their own properties and those of their neighbors if they want to avoid higher insurance costs. Vulnerability or Quality – Its Your Choice!